Chô gekijô-ban Keroro gunsô: Gekishin doragon woriâzu de arimasu! (2009) - Sci-fi-central.com. Chô gekijô-ban Keroro gunsô: Gekishin doragon woriâzu de arimasu! Japan  2009  77m   Directed by: Susumu Yamaguchi.  Starring: Etsuko Kozakura, Jôji Nakata, Kumiko Watanabe.. The half-witted earth invaders of Keroro platoon have been inadvertently transformed into dragons. Without warning, a "dragon's tail" is spotted in locations world-wide. Sergeant Keroro and the corps set about tracking down the source of the disturbances, but second class private Tamama disappears on his way to Paris. The troop sets out to France in a quest to track him down. 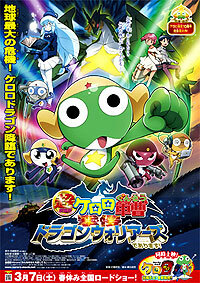 In a 10th year commemoration of the comic series by Yoshizaki Mine, this is the fourth Sergeant Keroro feature film. World heritage site Mont Saint-Michel is the backdrop for this animated feature film. Review by Unknown from the Internet Movie Database.